The surface modification of mesoporous silica monoliths through thiol–ene chemistry is reported. First, mesoporous silica monoliths with vinyl, allyl, and thiol groups were synthesized through a sol–gel hydrolysis–polycondensation reaction from tetramethyl orthosilicate (TMOS) and vinyltriethoxysilane, allyltriethoxysilane, and (3-mercaptopropyl)trimethoxysilane, respectively. 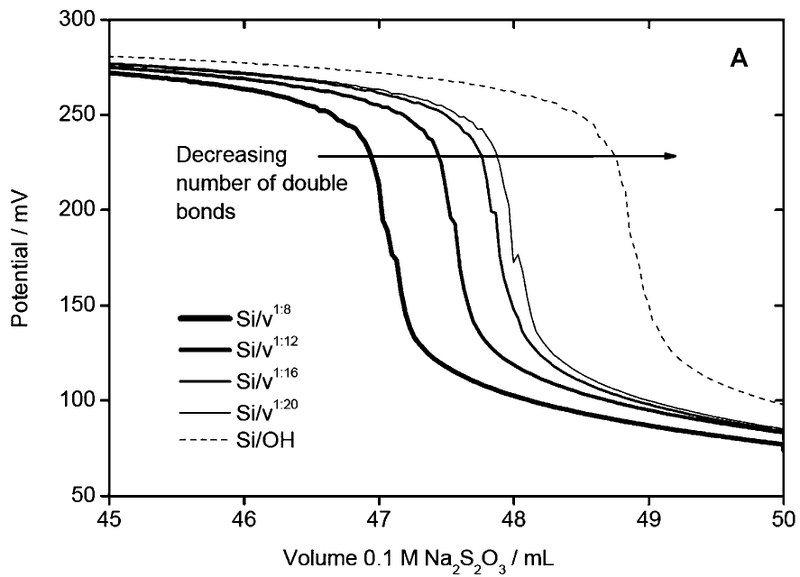 By variation of the molar ratio of the comonomers TMOS and functional silane, mesoporous silica objects containing different amounts of vinyl, allyl, and thiol groups were obtained. These intermediates can subsequently be derivatized through radical photoaddition reactions either with a thiol or an olefin, depending on the initial pore wall functionality, to yield silica monoliths with different pore-wall chemistries. Nitrogen sorption, small-angle X-ray scattering, solid-state NMR spectroscopy, elemental analysis, thermogravimetric analysis, and redox titration demonstrate that the synthetic pathway influences the morphology and pore characteristics of the resulting monoliths and also plays a significant role in the efficiency of functionalization. Moreover, the different reactivity of the vinyl and allyl groups on the pore wall affects the addition reaction, and hence, the degree of the pore-wall functionalization. This report demonstrates that thiol–ene photoaddition reactions are a versatile platform for the generation of a large variety of organically modified silica monoliths with different pore surfaces.